Frecklebox is a great online store for personalized gifts for kids. I was lucky to have been given the chance to review two of their amazing personalized items. 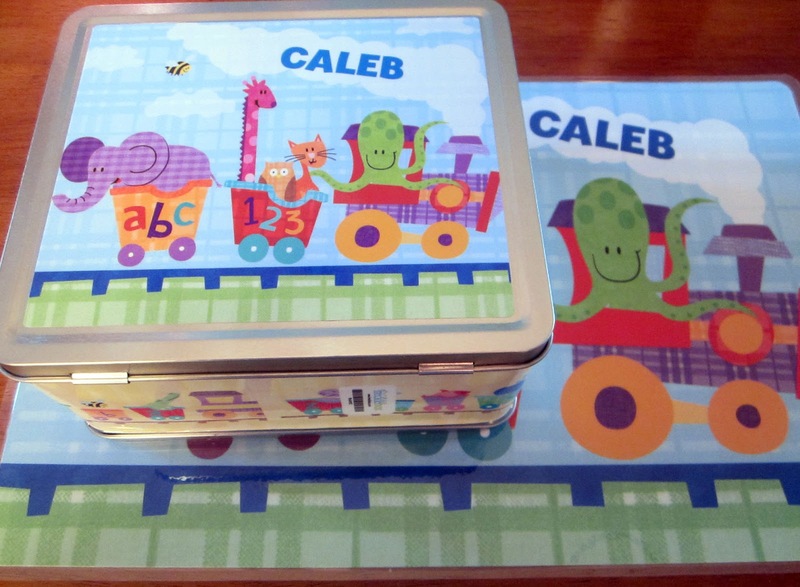 I found some really cute designs from their personalized lunch boxes, so I thought I would get that along with a matching personalized placemat for my little guy. As you may all know, I am a sucker for personalized stuff. So naturally, I was thrilled when I came across their website. They have such great products to choose from. From personalized books, coloring books, puzzles, posters, party favors, stickers, journal books to lunchboxes, placemats, growth charts and more. It truly is a unique site for cool kids stuff of all ages. 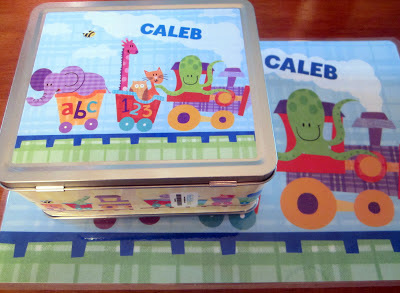 I chose the Alphabet Train design for both his lunchbox and placemat. He's in love with trains and having numbers, letters and animals with the train design is just fabulous. He was very excited when he opened the box and found these items. 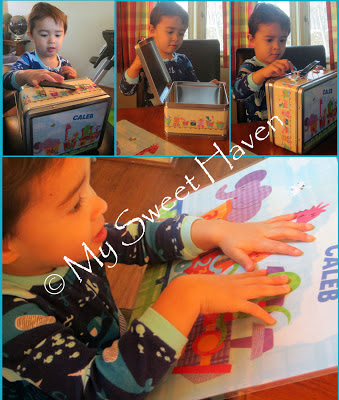 He carried the lunch box all around the house like there's some kind of precious treasure in there, lol! It's too funny! 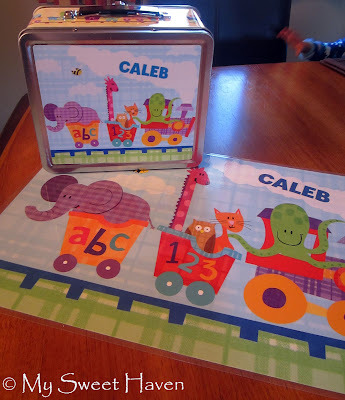 He will be starting daycare in a preschool facility next week so this lunch box would be perfect for his snacks and lunches while he's there. And having his name on it I think makes the items more special and cute. All Frecklebox products are printed on state-of-the-art digital printing systems. 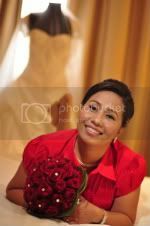 I must say they are really made of high end quality materials which are meant for the gifts to last. Plus, everything is made in the good old USA. Very fun! Look how busy and enthralled my 2 year old was with his new cool stuff. He definitely loves them. Wait..Don't go yet! You've just reached the fun part of this post. Because you will now have a chance to win a $30.00 electronic gift card so you could get your kids their favorite personalized items from Frecklebox. Now, isn't that awesome! It's so simple to join. If you're 18 years old and above and have a valid US address, you can enter the contest by using the Rafflecopter below. The contest starts from May 8th until May 17th. Goodluck to everyone! How nice! Hope to win and my little guy will be so happy to get one. Thanks Jen for a chance to win. I love frecklebox product. I got my kids a placemate for each and personalized notebook and sticker. If I win i want to get a lunchbox. Thank you for the giveaway. Would like the lunch box too for a niece's gift. I would get the personalized coin bank. I would love the books and the puzzles. Yay great stuff for Caleb! I bet he loves everything! They are amazing products I can tell! I would get personalized placemats.